Assigning a rating or grade to a canyoneering route is a great way to understand how one canyon might compare to another. It can give you a general idea of what gear you might need, and the skills that might be required for a safe and fun experience. With that said, there is a lot of variability that goes into the true difficulty of any canyon. It’s always a good idea to read a more detailed guide on any canyon before preparing to embark on your own. A canyon classification might seem like a jumble of numbers and letters at first, and it sort of is, but you can easily break it apart into its four separate parts. Technical – How difficult is the terrain? What, if any, technical ropework is required? Water – What complications or challenges could water create under normal conditions? The result is a seemingly incomprehensible mix of letters and numbers, but take a moment to break it apart and it will all become clear. The first part of a rating is a number from 1-4 representing the technical nature of the canyon in question. As always, see the route description for a more detailed look at the specific difficulties you might encounter. 1 – Non-technical Canyon Hiking: No rope is required. Might require some easy rock scrambling, or the occasional use of your hands for balance. Not quite a walk down the local street, but typically you can travel the canyon in either direction. 2 – Basic Canyoneering: Involves scrambling around with easy bouldering requiring the use of hands for ballance. A rope may be helpful for creating handlines, lowering gear, and in case of emergency. Travel is typically possible up or down the canyon without fixed ropes. 3 – Intermediate Canyoneering: Requires actual rock climbing climbs or rappels to move through sections. A rope is required for belays and single-pitch rappels. Exiting the canyon early or reversing direction would require fixing ropes. 4 – Advanced Canyoneering: Can require any of the following advanced techniques or challenges: Difficult exposed free climbing and or down-climbing. Climbing using direct assistance. Multi-pitch rappels or climbs. Complex technical ropework which might include rebelays, traverses, or guided rappels. Obscured or unclear natural anchors. And overall advanced problem solving and anchor building skills. The first letter of the rating, an A, B, or C, refers to the difficulties presented by typical water conditions. A – Normally dry or with very little water. Water can be avoided or is shallow only requiring waist deep wading at most. B – Water present with little to no current. Might have still pools requiring wading beyond waist deep water and/or swimming. C1 – Light to moderate current. Easy water hazards. C2 – Strong current. Water hazards require advanced skills and care. C3 – Very strong current. Dangerous water hazards require expert care. C4 – Extreme hazards will create difficult problems for even experienced experts with strong swimming skills. A movie theater style rating regarding the relative amount of risk involved. Again, all canyons have their own dangers and risks. G – General: Should be straightforward for those with the appropriate skills. PG – Beginner/Intermediate: Even with appropriate skills, beginners might find it difficult. R – Advanced: One or more added risk factors exist that could complicate the descent. Solid technical skills and sound judgment are critical. Not recommended for beginners. X – Extreme: Multiple risk factors exist that will complicate the descent. Errors in technique or judgment will likely result in serious injury or death. Descent should only be attempted by expert canyoneers. A roman numeral giving an estimation of how long it would take a group of 6 people to complete the journey. Time required can greatly vary based on the size and experience of your group compared to the challenges presented by the canyon. I – Hours: A short trip normally requiring only a couple of hours. II – Half Day: Normally requires a half day. III – Day: Normally requires most of a day. IV – Long Day: A long day with an early morning start and a late night end. Bring a headlamp and plan for overnight contingencies. V – Overnight: Plan for one and a half days. VI – Multiple Days: Expect two full days or more for completion. These ratings are adapted from the American Canyoneering Association’s Canyon Rating System. Rock-N-Water is a Christian Adventure Camp located in northern California about an hour West of South Lake Tahoe. 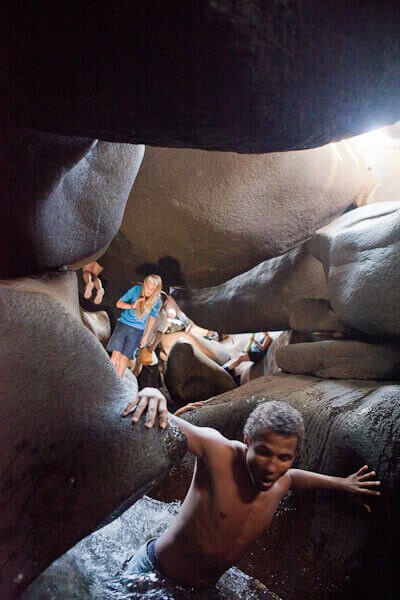 Our guided canyoneering trips are idea for groups of 6 or more people. We explore a wide variety of canyons for our canyoning trips, with some perfect for students as young as 8, while others will challenge even athletic college students.